I made a short stopover in Dresden on my way from Brussels to Berlin. Really, Dresden contains my two most hated styles of architecture: hideous East German Workers Paradise grimness and the vastly different but also hideous overblown Baroque. So, on paper, I shouldn’t really have gone, but my sister encouraged me. I’m glad I did. Reminders of the two World Wars are ever present in Europe, from fields of poppies and vast war cemeteries in Belgium to bombed and bullet scarred buildings that remain today, with commemorative plaques recognising events and injustices everywhere. For me Dresden is a triumph. The city suffered appallingly with six days of firebombing at the hands of the Allies near the end of the war for no good reason other than terror. The historical centre was reduced to rubble. At least 25,000 people died in the inferno and those that survived lived under the gaze of one of the most efficient and brutal authoritarian secret police that ever lived, the East German Stasi. Dresden has been rebuilt and many of the original historic buildings restored. The Frauenkirche, a magnificent piece of baroque engineering was rebuilt stone by stone after the reunification of Germany. It is just astonishing that it was done. The city is set on the banks of the Elbe and is stunning viewed from the opposite bank in a scene pained by Canaletto. On the way to Dresden I had a long wait for a sleeper train connection in Cologne, so I grabbed dinner at the Past and Future vegan restaurant, an unassuming home style place ten minutes walk from the centre of town. For around 11 euro I had a plate full of food from a buffet which was a strange cross cultural mix of salads, sushi, lasagna, German food and Thai. Hearty home cooking and tasty, but not stellar. I went for some salads, lasagna and a German bread dumpling with a creamy mushroom sauce, all pictured at the top of the post. There was also a vegan restaurant in Dresden (The False Hare) which I had intended to try, but I never made it. Instead, I ate some tapas outdoors, with a beer on a lovely warm night in the fading light at 10pm. Summer days are so long here! Dresden was also my first sighting of the charming East German traffic signals. After reunification East Germans were fond of very little of the old, but apparently they fought a battle to keep their traffic signals. There are now shops selling all kinds of paraphernalia depicting ‘Ampelman’. After a day and a half in Dresden I set out for Berlin. I am wildly impressed with the public transport and the food so far. My first day I had to do some long overdue laundry so my food choice for dinner was based on its proximity to the laundromat! Huong Sen is a vegan Vietnamese restaurant, which to be honest I wasn’t expecting to be wowed by as we have a large Vietnamese community at home and I’ve eaten some great Vietnamese food there. I was wrong. I was wowed. 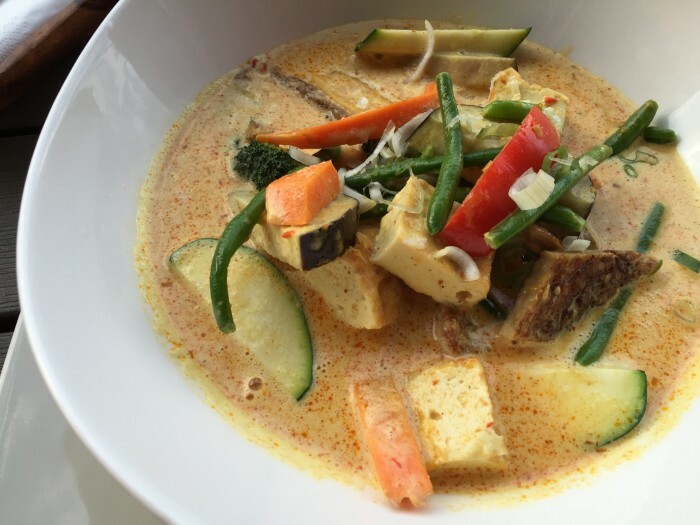 I had the most delicious spicy coconut curry soup with noodles, soft and crispy tofu and vegetables, washed down with a wheat beer while my clothes washed a five minute walk away. After the war Germany needed guest workers to help rebuild so Turkish people arrived in West Germany and Vietnamese people in the East to work. So there are quite significant populations of both in Berlin. There are vegan versions of both cuisines to be found. I’m hunting down a vegan doner kebab…stay tuned.